When I found out that my friend, Mackenzie, had a blog, I was so excited to approach her about doing a logo and branding. Over on her blog, Learning to Live & Love, Mackenzie discusses her journey moving across the country to a new city, mental health, and other anecdotes. From the questionnaire I sent her, she desired a brand that was simple, modern and exuded peaceful, tranquil, and “homey" feelings. She liked the idea of playful fonts (nothing with a strong script) and was attracted to creams, soft grey, pops of teal, and soft peach. Mackenzie put together a brand inspiration board on Pinterest and from there, I arranged the photos and added colors into a mood board that set the tone for the overall feel and style of the brand. Ahh the fun part! I found different fun graphics that I could include with a range of display fonts. I can't show them here for copyright reasons, but she decided on a final design with an earthy graphic. Here was the final design in black and white. Then I provided some color palette options for her to choose from based on the feedback I received before the start of the project. She loved #1, so I applied those colors to the final logo design to provide her with different options. I then created various alternative logo options. Mackenzie chose 1.2 for her main logo and 2.5 as her alternative logo. Next, I moved on to organizing the logo, logo variations, fonts and color palette onto the style board. Then I designed the graphic elements - "buttons" for her site, a line/divider, and signatures she could use on her About page. I also found cute textures that matched Mackenzie's brand. Mackenzie also received a style guide, which breaks down further how the fonts should be used (headings, paragraph, decorative) and the various color codes (CMYK, RGB, hex). There you have it! This was such a fun project and I was so excited to bring Mackenzie's brand vision to life! 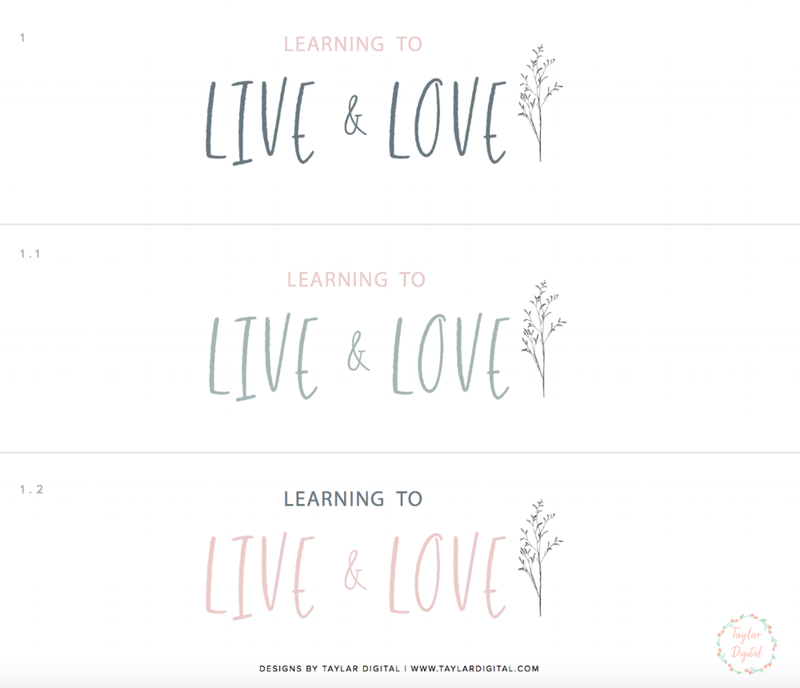 Below, you can see how she used the branding materials on her blog. Are you in need of branding for your blog or business?